Obama poll-watchers have been waiting to see a "bump" upward in public opinion job approval ratings pretty much ever since he took office. In two years, there really hasn't been one. Until now. In January, President Obama's approval rating went significantly higher, while his disapproval rating continued a trend of dropping with a big spike downward. What both of these meant, taken together, is that Obama is once again "above water" in the polls, with his approval rating beating his disapproval rating. This hasn't happened since last June. But, in reality, Obama has pretty much erased his past entire year's slow slide in poll numbers -- in a single month. Obviously, he didn't hit an all-time high in absolute numbers, but still, when taken month-to-month, January, 2011, was Obama's best month of his entire presidency. Not only did he finally get his bump -- but it was a truly significant bump. Obama had four things happen that helped his numbers enormously in January. The first was a holdover from December -- all of the things the lame duck Congress managed to get done after Obama cut a tax deal with the Republicans. This is really where his daily approval numbers started to climb. Then, at the beginning of the month, the unemployment rate dropped sharply, from 9.8 percent to 9.4 percent. That's still unacceptably high, but it is also a big step in the right direction. The public reflected this by pushing Obama's poll numbers even higher on the news. The real catalyst, however, was the tragedy in Tucson. There's always a "rally 'round the president" effect in the polls, which happens just about every time we face a national crisis -- no matter who happens to be president at the time. And Obama's handling of the situation brought almost-universal praise, from people across the political spectrum. Obama's Tucson speech reminded a lot of people why they voted for the man in the first place, and his approval ratings jumped dramatically as a result. Right after the Tucson speech, President Obama gave his annual State Of The Union speech, which was also well-received (for the most part). The changed atmosphere in the room was a key factor, with mixed seating and no dueling partisan standing ovations. Obama didn't gain much from this speech in the polls, but he did solidly hang onto the spike upwards from the Tucson speech ("rally 'round the president" bumps are notoriously short-lived, at times). He has been holding steady at a much higher level as he heads into February, and his prospects look good for posting further gains next month. For the month of January, Obama charted 48.5 percent approval -- up an astonishing three full points over his previous month. 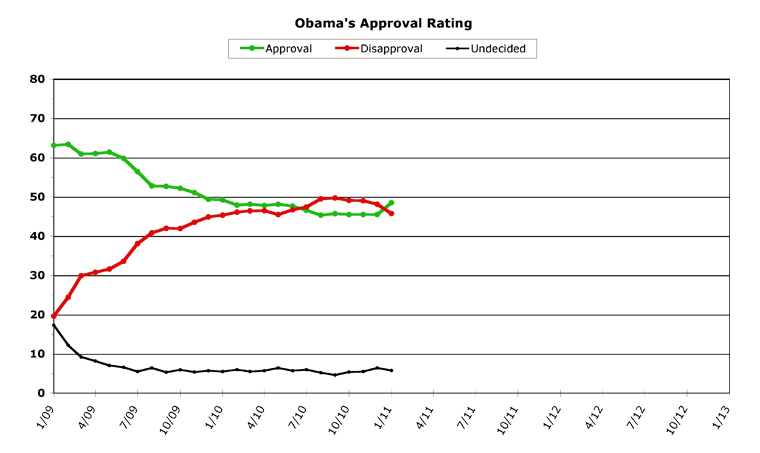 At the same time, he posted a disapproval rate of only 45.7 percent -- down a similarly-astonishing 2.4 points. His "undecided" numbers went down slightly from last month's high, to 5.8 percent. For both approval and disapproval, this is the biggest positive change month-to-month Obama has ever charted. By far -- his change in disapproval is almost two-and-a-half times better than his previous "best" month; and his change in approval is seven-and-a-half times as big as his previous record in this category. As I said, this has been the best month in terms of change-over-time that Obama has ever seen, and has reset his standing with the public back at least a full year (if not even further). That's a pretty good month, all around.